Our current society is confronted with major challenges concerning the environment, the energy and the access to the food and water. The renewable resources constitute relevant objects of study. Among these, microalgae draw a quite particular attention. Indeed, as major part of the phytoplankton, microalgae are essential for the global food chain and the marine ecosystem. Phytoplancton is responsible for the half of the primary production on Earth, it plays an important role in CO2 sequestration and it may participate for reducing contaminants as microalgae can rapidly adapt to polluted environments[3-5]. In addition to these ecological benefits, microalgae are considered as one of the most promising feedstock for biofuels and chemicals because they generate valued bio-products like pigments, antioxidants and lipids[6-8]. Interest in microalgae for oil production is based on their rapid growth rate, low land-area requirements and their ability to convert solar energy into fatty acids which can be turned to biodiesel via transesterification reactions or used as food complements. Oleaginous microalgae are capable of accumulate from 20- 50% up to 80% of their dry cell weight as triacylglycerols (i.e. TAGs)[11,12] when they are subjected to alteration in culture conditions (limited supply of nitrogen, high salinity, high light intensity). Algal biodiesel can be used in existing engines with little or no modification and has a higher flashpoint, faster biodegradation and greater lubricity as compared with traditional diesel fuel. Microalgae are the primary source of PolyUnsaturated Fatty Acids (PUFAs) that have nutritional and pharmaceutical interest. The n3-PUFAs are of particular importance as they cannot be synthesized by humans and are thus obtained only through dietary sources. Long chain n3-PUFAs are hypotriglyceridemic and thus important in the prevention of human cardio-vascular and inflammatory diseases. The nutritionally important C18 and C20 PUFAs including n3-PUFAs are present in substantially high amounts in microalgae. Although fish is also a source of PUFAs, these organisms usually obtain their PUFAs via bioaccumulation through the food chain. Fish PUFAs production depends on fish quality and sufficiency while that of algae does not. In addition to optimization of culture conditions, strain selection is also of importance. There has been an interest in isolating new native microalgal strains when a large-scale application is intended. The marine biodiversity of Western Southwest of Indian Ocean (WIO) is one of the least known globally, with major gaps in species distribution records of even well known taxonomic groups. Then, the 3 microalgae of WIO have been little studied[18,19] and few studies have been done on[20-26]. But no studies were performed on the chemiodiversity of these two taxonomic groups. The present study is carried out to characterize 27 marine tropical microalgae and cyanobacteria isolated from benthic habitats for their total lipid content, lipid classes distribution and fatty acids composition. The generated data allow to approach an evaluation of their potential use for applications in the field of biodiesel and nutritional products. In this objective, various parameters, giving evidence of the quality of fatty acids, are determined. These parameters are estimated in relation to the carbon chain size and the amount and/or position of double bonds in fatty acids. To the best of our knowledge, the lipid profiles for these tropical marine microorganisms, from South West Indian Ocean belonging mainly to Dinophyceae and Cyanophyceae, are reported for the first time in the present study. Microalgae and cyanobacteria studied in the current work come from the PHYTOBANK collection at HYDRÔ REUNION. The strains were collected in the Southwest Indian Ocean from 1992 to 2013. Sampling was performed during various research programs conducted by HYDRÔ REUNION in Réunion, Mayotte, Madagascar and Scattered Islands (Europa and Glorioso Islands) (Figure 1). 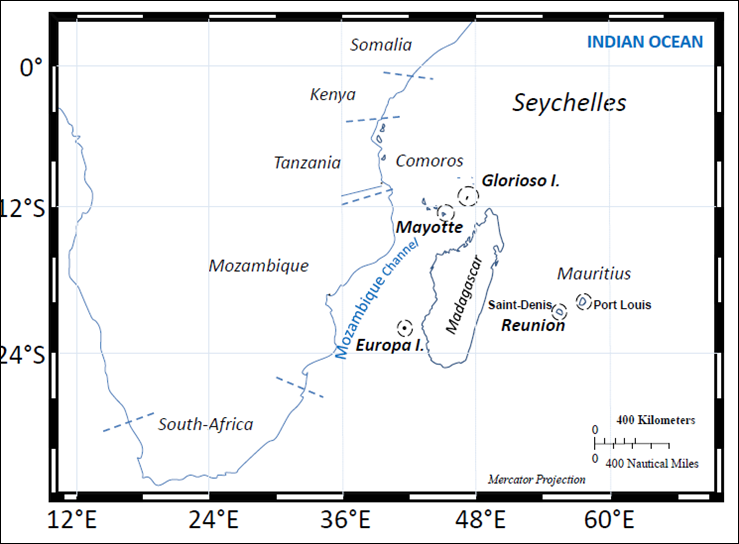 Figure 1: Geographical localization of microalgae and cyanobacteria sampling in the Southwest Indian Ocean (Réunion, Mayotte, Madagascar, Mauritius, Europa, Glorioso Island). Cyanobacteria and microalgae benthic were sampled using scuba-diving or snorkeling, supported by photographic documentation. At laboratory, cyanobacteria samples were subdivided into three subsamples: one part of the sample was preserved with formaldehyde (4%) for later microscopic analysis; a second part was stored in ethanol for DNA analysis, and a third part was prepared for culture filing some filaments in agar plate and in liquid medium. Using an inverted microscope, microalgae cells are individually isolated by pipetting quickly after sampling, 3-fold rinsed in sterile seawater and transferred in plates with medium for growing. After some transfers to reach a high cell density, microalgae strains are transferred and cultured in glass tubes in F/2 medium (or F/2 medium supplemented with silicium for diatoms strains) at 26°C with a 12:12 hours photoperiod (around 20 - 40 photons m-2.s-1). The cultures are then maintained in the PHYTOBANK collection (Table 1). Raw biological samples are screened for cyanobacterial specimens using microscopic lens and light microscope, and subsequently subjected to liquid culture enrichment, agar plates streaking or micromanipulation. Isolation and cultivation are performed using modified BG11 medium or Z8 medium medium in sterile seawater and using 18 g/L agar concentration for agar plates. Seawater samples are filtered with glass fiber filters GF/F and autoclaved. The cultures were kept under a 12:12 hours photoperiod (around 20 - 40 photons m-2.s-1) at 26°C. After several transfers of filaments, cyanobacteria strains are isolated and conserved at PHYTOBANK collection (Table 1). For large-scale biomass production, isolates are grown in 250 mL to 5L culture vessels with aeration under the same culture conditions previously cited. After 3 - 4 weeks of growth, cells are harvested at stationary phase by filtration (species forming biofilms) or centrifugation for motile species (4000 g during 3 minutes, with Thermo Electron Co., Heraeus™ Megafuge™ 1.0R centrifuge), frozen at -20°C and freeze-dried. For each strain the total biomass is obtained from several cultures with successive harvesting, due to laboratory limitations for large-scale culture. Algal lipids are extracted in dichloromethane-methanol (2:1, v/v) using a modified Folch procedure as described by Parrish. Lipid classes are separated by thin-layer chromatography using flame ionization detection (TLC-FID) with an Iatroscan MK-6 (Shell USA, Fredericksburg, VA, USA) as described by Parrish (Parrish 1987). Extracts are spotted on silica gel-coated chromarods (SIlI, Shell USA). The different classes are triacylglycerols (TAG), free sterols (ST), phospholipids (PL), acetone-mobile polar lipids (AMPL), free fatty acids (FFA), ketones (KET) and free aliphatic alcohol (ALC). The fatty acids (FA) are extracted through direct transesterification. All fatty acid methyl esters (FAMEs) are analyzed by GC-MS (Thermo Fisher Scientific Inc., GC model Trace GC Ultra and MS model ITQ900) equipped with a Supelco Omegawax 250 capillary column (30 m x 250 μm x 0.25 μm film thickness). Initial oven temperature is 100°C for 2 min, then 140°C for 1 min and is increased at a rate of 10°C min-1 until it reaches 270°C. Injector temperature is 90°C and a constant helium flow of 1.0 mL min-1 is used. A volume of 1 μL was injected. Fatty acids (FA) are identified and quantified by comparing retention times and mass spectrum with known standards calibration curve with concentration ranging from 0.5 to 20 mg/mL (Supelco 37 Component FAME Mix Supelco Inc., Belfonte, PA, USA) with the use of Xcalibur v.2.1 software (Thermo Scientific, Mississauga, ON, CA). Results are expressed as the mean±standard deviation (SD) of three replicates. The lipid content and fatty acid profile data obtained are submitted to a variance analysis. The tests and the corresponding p values are indicated in the legends of the figures. All analysis are performed on 3.1.2 R version and package FatoMineR. Hierarchical clustering is also conducted in the form of an agglomerative hierarchical clustering in combination with an Euclidean distance metric. The criterion employed to cut the dendrogram is to divide into groups at the point of maximal loss of intra-cluster inertia (default criteria in FactoMineR package). The carbon chain sizes and the amount and/or position of double bounds are factors that determine the molecular structure of FAME. Additionally, these molecular characteristics influence the parameters of biodiesel quality such as cetane number (CN), iodine value (IV), cold filter plugging point (CFPP) and oxidation stability. The CN, saponification value (SV) and IV can be calculated based on the FAME profile using equations described below. The unsaturation index is calculated by multiplying the percentage of each fatty acid by the number of double bounds followed by summing up their contribution. The tropical microalgae and cyanobacteria strains belonging to the families of Prorocentraceae, Gymnodiniaceae, Stylonemataceae, Synechococcaceae, Oscillatoriaceae, Symbiodiniaceae, Pseudanabaenaceae, Merismopediaceae, and Pavlovaceae are listed in Table 1. Table 1: List of the 27 microalgae and cyanobacteria strainsinvestigated in this study (isolated from islands located in the Southwest Indian Ocean). The lipid composition of the selected microalgal strains is presented in Table 1 and table: 2. Total lipid content in the investigated species ranges from 1.01 to 42.62% mass fraction of dry biomass, with an average lipid content of 18.59% for dinoflagellates and 5.82% for cyanobacteria. Among the various dinoflagellates analysed, Amphidinium strains have the highest total lipid contents (ranging from 6.41 to 42.62% dry wt), followed by Prorocentrum members such as P. lima with 15.31 and 23.37% for P-08 and P-37 strains respectively. The total lipid contents are in comparable range with previous reports for the different microalgal strains. Many works have reported that lipid content from a variety of freshwater and marine microalgae is between 1 to 26%[1,39]. Among the 27 strains considered, the A. carterae strain P-63 from Madagascar exhibits the highest total lipid content with a 42.62% dry wt value. Mansour et al., using Amphidinium sp. from Australian waters, have mentioned that the total lipid content fluctuated between 8.7 and 9.7% dry wt.. The tropical strains studied here seem to be able to accumulate more lipids. Among the 14 dinoflagellates selected, 7 of them show lipid accumulation superior to 20% mass fraction at stationary phase and could be considered as high lipid producing strains. Table 2: Lipid classes of tropical microalgae and cyanobacteria strains. Nevertheless, as shown in Table 1, the biomass productivity remains weak in the culture conditions used in the study. For the most productive strain, C-24, the biomass productivity reaches 77 mg/L/d. This value is similar to those obtained by Talebi et al..
No linear correlation is observed between total lipid yield and biomass productivity (mg/L/d) (r2 = 0.20) for all species. This result is in agreement with other studies[40,42]. It is admitted that biomass productivity depends on cell proliferation, while the lipid production depends on the specific ability of microalgae strains to produce and store lipids. It is important to underline that the capacity of production and storage of microalgae in lipids depends in an important way on conditions of culture. So it is possible to optimize the conditions of culture to favour the production of lipids, thing which was not made within the framework of this screening study. Microalgae produce and contain lipids and fatty acids with different functions as membrane components, storage products, metabolites and sources of energy. Lipids classes produced by microalgae depend on various factors such as species, growing and harvesting conditions. The distribution of lipids in various classes is analysed by IATROSCAN: polar lipids (PL, AMPL and HC) and neutral lipids (TAG, KET, ST, FFA and ALC) are quantified. Lipid class compositional data of the 27 strains of microalgae and cyanobacteria used in this study are presented in Table 2. Polar lipids (PL+AMPL) are the major lipid class detected in all samples. To a lesser extent, neutral lipids are also present; mainly free fatty acids (FFA) and triacylglycerols (TAG). Among cyanobacteria samples, polar lipids vary from 76.34 to 98.34% of total lipids (average content of 88.83%). The maximal value (98.34%) was obtained for the Spirulina sp. C-17 strain. For the 14 dinoflagellata strains considered, A. massartii P-42 strain exhibits the highest AMPL+PL level (96.72%), displaying an average value of 74.88%. AMPL are found to be the major lipid class in all group members and vary from 53.39 to 97.3% of total lipids (average content of 69.53%) for cyanobacteria and 31.89 to 83.72% for dinoflagellates. Similar findings are reported by Volkman and Dunstan. The PL and FFA are the second and third most abundant lipid classes detected in isolates, displaying average values (% of total lipids) of 20.25 and 23.02% for PL, 4.90 and 10.26% for FFA for cyanobacteria and dinoflagellates, respectively. The highest proportion of AMPL is observed for Spirulina sp. (C-17), at 97.3%. On the other hand, the highest percentage of PL is observed for Symbiodinium sp. (P-78) at 48.38%. PL is negatively related to TAG. Indeed, their common intermediates are likely to be directed toward TAG if PL synthesis is slowed down[11,46]. For FFA, the high content of 47.63% observed in Table 2 might be due to the degradation of lipids by lipases. The variation of TAG content in the investigated species vary from 0 to 32.82% with highest values for dinoflagellates. However, TAG value is significantly higher in Prorocentrum lima strain P-37 (Wilcoxon, P < 0.05) with an average value of 32.82%. Neutral lipid TAG accumulation has not been observed in naturally occurring cyanobacteria but in our study one strain of cyanobacteria has a high percentage of TAG (C-16 [16.63 %]). Since the culture is performed in standard conditions, it is not optimal to obtain reserve lipids like TAG. Thus majority of the lipids is in the membrane structure. The production of TAG is favoured from the biosynthetic pathways of microalgae put under metal stress and nutrient limitation. Then TAG are going to play a protective role. The FA compositions of the 27 tropical microalgae and cyanobacteria strains considered in this study are presented in Table 3. The considered common FAs in microalgae and cyanobacteria were detected, with quite variable proportions, due to the fact that FAs compositions are not only species-specific, but also depend on culturing variables (growth phase, temperature, light intensity, salinity, nitrogen depletion…). Table 3: Fatty acid composition of tropical microalgae and cyanobacteria strains (% mass fraction of total FAMEs). Others: Rhodophyta (C-03), Haptophyta (P-69) and Cryptophyta (P-67 and P-70), Data expressed as mean ± SD (n = 3). *: not detected. The highest proportion of Saturated Fatty Acids (SFAs) is observed at 62.7% for P-67 strain (Cryptophyta) and in the case of MonoUnsaturated Fatty Acids (MUFAs) at 77.5% for C-16 strain cyanobacteria Leptolyngbya. On the other hand, the highest percentage of PolyUnsaturated Fatty Acids (PUFAs) is observed in the dinoflagellate Symbiodinium P-79 strain at 61%. In the case of all microalgae and cyanobacteria strains tested, palmitic acid C16:0 is the most abundant SFA (51.9 to 18.6% interval), with the exception of the Symbiodinium P-79 strain. In the MUFAs group, the most produced by all strains is palmitoleic acid 16:1 (between 0.7 to 75.9%), followed by oleic acid 18:1(n-9) (between 0 to 21.7%) with higher values in cyanobacteria. Among the PUFAs group, n-3 fatty acids are the most produced, and eicosapentaenoic acid (EPA, 20:5(n-3)) and docosahexaenoic acid (DHA, 22:6(n-3)) are found to be dominant among the dinoflagellates. The group of 14 dinoflagellates strains shows a predominance of palmitic acid, palmitoleic acid, eicosapentaenoic acid EPA 20:5 (n-3) and docosahexaenoic acid DHA 22:6 (n-3). The major FAs detected in Amphidinium strains are palmitic (22.7 - 49.3%), palmitoleic (0.7 - 46.9%), stearic (18; 0 - 8.6%), and eicosapentaenoic acid (5.0 - 45.3%) that collectively contribute to 50.8 – 95.9% of total FAs pool. The high proportions of 16:0, 16:1(n-7), 18:0 and EPA are in agreement with previous analysis for Amphidinium strains. Nutritionally important FAs like EPA and DHA are detected only in strains belonging to Dinophyceae class. Among them, stearidonic acid C18:4(n-3) is found with higher percentages in Symbiodinium strains, displaying a maximum value of 23.7% for the P-79 sample. Fatty acids profiles of Symbiodinium strains are characterised by high amounts of palmitic and palmitoleic acids (up to 33.7% and 37.9% respectively), as well as PUFAs of n-3 series, such as stearidonic, eicosapentaenoic and docosahexaenoic acids (up to 23.7%, 20.4% and 32.2% respectively). Exception is P-79strain, which contains no 16:0. The high proportions of C16 FAs and PUFAs (n-3) are in agreement with previous analysis for Symbiodinium strains[48-50]. Palmitic, palmitoleic and oleic acids are found to be the major FAs in all Cyanophycae members, ranging from 21.0 - 51.9%, 6.3 - 75.9% and 0 - 21.7% of total FAs respectively. Concentration ranges for the major FAs in the both Leptolyngbya strains are: 16:0 (21.0 - 45.5%), 16:1 (n-7) (2.7 - 75.9%), 18:1 (n-9) (0.0 - 16;5%), 18:2 (n-6) (0.0 - 13.3%) and 18:3 (n-3) (0.0 - 14.4%); these results are quite similar to those obtained by Singh J. et al. The P-69 strain, the only Haptophyceae species studied, exhibits a relatively simple fatty acid profile with EPA, 16:0, and 14:0, corresponding to 65.7% of the total FAs pool, followed by 16:1(n-7) (12.3%) and DHA (7.7%). Microalgae are an interesting resource for the production of biodiesel. The production process includes various stages: culture, harvesting, drying, extraction of lipids and reactions of transesterification with an alcohol (methanol or ethanol) in the presence of catalyst to obtain the fatty acids methyl esters of fatty acids (FAME) or fatty acids ethyl esters (FAEE) used as biofuels. The viability of the industrial process bases not only on the choice of the producing strains and the conditions of culture to adopt (a compromise between the growth rate and the production of lipids) but also on the quality of lipids produced by these strains. So various criteria are used to give evidence of the quality of produced lipids. They are estimated from the molecular structure of the FAME in particular the length of the carbon chain and the quantity and position of the unsaturations. Among these criteria, are found the cetane number (CN), the saponification number (SN), the iodine value (IV) and the cloud point (CP). They give an evaluation of the capacity of the biodiesel to the auto-ignition in the combustion chamber, its stability (against oxidation reactions) and its cold viscosity. The necessity of specialized apparatus not always available besides a high amount of oil to directly measure the critical properties lead to the use of predictive models that allow a preliminary evaluation. These models depend on the fatty acid ester composition of extracted oils. More precisely, the Saponification Number is useful for a comparative study of the fatty acid chain length in oils. The Iodine Value refers to the tendency of biodiesel to react with oxygen at near ambient temperature and to undergo an oxidation. It is correlated to the number of double bonds. Its calculation gives rise to two important observations: i) the IV of a mixture of fatty compounds depends on the amount of the several unsaturated fatty components in the mixture but not on the exact nature of the double bonds in the structure of those fatty compounds (conjugated unsaturation) and ii) the IV does not depend on the nature of the saturated components but only on their total amount. Furthermore, the higher the unsaturation of the biodiesel, the higher the tendency of unsaturated components to polymerize and form engine deposits. The cetane number measures the readiness of the fuel to auto-ignite when it is injected into the combustion chamber. CN increases with the length of the unbranched chain of FAME components. It is the most cited indicators of diesel fuel quality. The range required is 40 - 50. The low temperature flow properties of biodiesel are characterised by cloud point (CP) and pour point (PP). CP is the temperature at which a sample of the fuel starts to appear cloudy, indicating that wax crystals have begun to form that can clog fuel lines and filters. PP is the temperature below which the fuel will not flow. High CP and PP values of biodiesel can be explained by high contents of saturated fatty acid alkyl esters because the unsaturated fatty alkyl esters have lower melting points than saturated fatty acid alkyl esters. All the data are described in the table 4. The tropical strains Prorocentrum lima (P-37), Amphidinium massartii (P-41) and tropical cyanobacteria Leptolyngbya sp. RS01 (C-16) have the highest amount of lipids suitable to biodiesel production. Prorocentrum lima (P-37) in standard conditions, has the highest TAG yield (32.82 ± 17.51%) (table 2) and a lipid content of 23.37% (table 1). This species has favorable biodiesel properties with high value of CN (46.79) and low values of IV (121.23), indicating a potential microalgal source of biodiesel production. Prorocentrum lima is a benthic dinoflagellate that can produce diarrhetic shellfish poisoning (DSP) toxins. Many studies concerning this microalga are only focused on the toxin composition and concentration. Amphidinium massartii (P-41 strain) has encouraging properties to produce biodiesel with high average value of CN (50.28 %) and low average values of IV (99.02%). And its TAG content (11.17%) is significantly higher than others species, but lipid content (11.91%) is not significantly high. Table 4: Biodiesel properties based on FAME profiles of tropical microalgae and cyanobacteria strains. The cyanobacteria strains have good properties for biodiesel production, but their TAG (Table 2) and lipid contents (Table 1) are significantly lower. There is an exception, Leptolyngbya sp. RS01 C-16 has interesting characteristics with CN (53.74%), IV (78.76%), TAG rate (16.63%) and lipid content (5.08%). Moreover, this strain has only 0.54% of PUFA of total fatty acids. These data are important because microalgae often have a high rate of polyunsaturated fatty acids with 4 or more double bonds, and this unsaturation rate can favour oxidation of the lipid during storage. Our statistic approach PCA (Figure 2) explains 89.34% of the information on the initial variables by retaining two dimensions. In the first axis, 55.58% is positively related to BAPE, IV and DU, and negatively related CN and SV. CN indicates the time required for the ignition of the fuel when it is injected into the combustion chamber. The higher is CN the shorter the ignition delay. IV quantifies the amount of unsaturation and the tendency for the bio-diesel to react with the oxygen. To limit that reaction, IV has been limited to 115. CN is inversely related to IV as shown by the first axis. So a high value might desirable for CN to obtain a low IV but this might also lead to the solidification of biodiesel. So an upper value has been fixed to 65 in US biodiesel specification. In the second axis, 33.76% is positively related to CFPP and LCSF,and negatively related to APE. That conclusion was also reached in[42,57]. Figure 2: Correlation circle plot showing a projection of the variables obtained with PCA. The first and second axis of score-plot PCA explain 55,58% and 33,76% respectively of the observed variation. 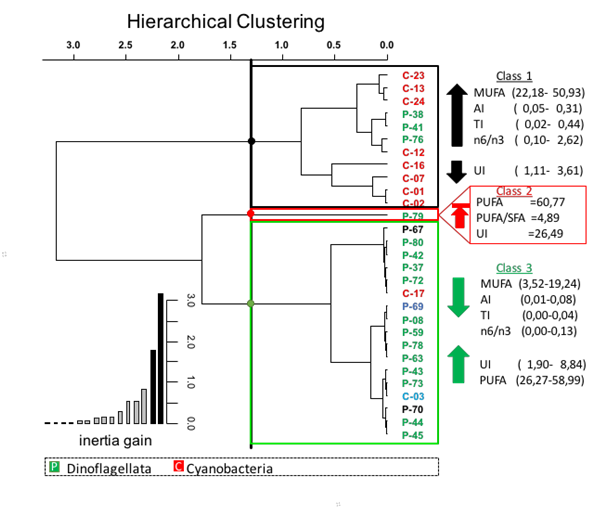 This PCA indicates a clear differentiation between three distinct clusters (Figure 3). The first cluster is formed by cyanobacteria, cryptophyta and some dinoflagellata. Those have a high CN (53.02 ± 4.20) and a low IV (89.66 ± 19.44) and BAPE (45.26 ± 22.49). The second cluster is formed by Rhodophyta, Haptophyta and some dinoflagellata. Those have a low LCSF (4.76 ± 1.60) and CFPP (-1.52 ± 5.04). The third is only formed by dinoflagellata. Those have a high LCSF (12.98 ± 1.42) and CFPP (22.74 ± 4.45). Those clusters are defined by those variables but this differentiation can be also related to their taxonomic group (Figure 4). Furthermore, there is no correlation with their geographical origin (data not shown). This may be explained by the geographical proximity of the origin of the samples and by the identical conditions of culture used in the study. The microalgae from the cluster 1 (Figure 3) are the most interesting resources of biodiesel due to their values of CN and IV that respecting the requirements. Figure 3: Cluster analysis of 27 microalgae species based on biodiesel properties of microalgae. Unweight pair-group average with Euclidean distance. Figure 4: Individual factor map obtained in all individuals (n = 27) by principal component analysis. Individuals are projected and each color corresponds to a specific taxonomic group. Lipids play varied and critical roles in cellular metabolism, with functions dramatically modulated by the individual fatty acid moieties in complex lipid entities. The quality of administrated lipids seems to play a crucial role in the occurrence (or not) of alterations and their severity. An example is coronary heart disease that is in most instances due to the obstruction of coronary vessels by atherosclerosis or thrombosis. Thus diet is a key factor in the fight against these diseases. Variables used to estimate the nutritional quality of microalgae are based on the 3 types of fatty acids (SFAs, MUFAs, PUFAs) and can be calculated as the polyunsaturated/saturated acids ratio, the omega 6 and 3 ratio (n6/n3), the unsaturation index, the atherogenicity index and the thrombogenicity index. As an example, the minimal recommended value PUFAs / SFAs is 0.45. The profiles of fatty acids presented in the table 3 show 27 acids of C12 to C24 chains and the nutritional index in table 5. In our study the tropical microalgae have ratio (PUFAs/ SFAs) between 0.02 and 5.01 corresponding to the cyanobacterium Leptolyngbya sp. RS01 (C-16) and the dinoflagelate Symbodinium sp. Y6-1 (P-79) respectively. Over 70% of the studied microalgae meet the criterion of ratio PUFAs / SFAS. All dinoflagellates have ratios of greater than 0.45 except for P-41 and P-76. Table 5: nutritional index of tropical microalgae. Another indicator usually used is the ratio between omegas 3 and 6. This ratio should not exceed 5 and it is desirable that it remains lower than 4. In our study, this ratio varies from 0.01 to 2.62 % and thus is lower than 4. All the studied micro-seaweeds have a ratio n6/n3 in agreement with the international recommendations. The unsaturation index of institution (UI) is the average number of double bonds by lipidic molecule. This one is important to know the stability of lipids towards the oxidation. The unsaturation index of the lipidic fraction varies between 1.11 and 26.49 %. Atherogenic index (AI) measures the capacity of the food to reduce the content of lipids in the blood. Thrombogenic index (TI) measures its capacity to reduce the platelet activity. Lipids of the tropical microseaweeds have an index AI between 0.01 % and 0.34 % and an index TI between 0 and 0.44 %. The obtained values are low, which confirms the advantage of microalgae as a source of lipids. Indeed, many values of AI and TI have been published for macro-algae (Ulva lactuca AI = 1.1% and TI = 0.8%), pork (AI = 0.69%), chicken (AI = 0.50%) and rabbit (AI = 0.82%). Figure 5: Correlation circle plot showing a projection of the variables obtained with PCA. The first and second axis of score-plot PCA explain 58,39% and 27,45% respectively of the observed variation. To guarantee a good interpretation of these 8 variables, an analysis of main components is realized. The representation in 2 dimensions preserves 85.84 % of the information contained in the whole of variables (Figure 5). All these variables are correctly represented in the main plan. The first and the second axes represent 58.39 and 27.45 % respectively. 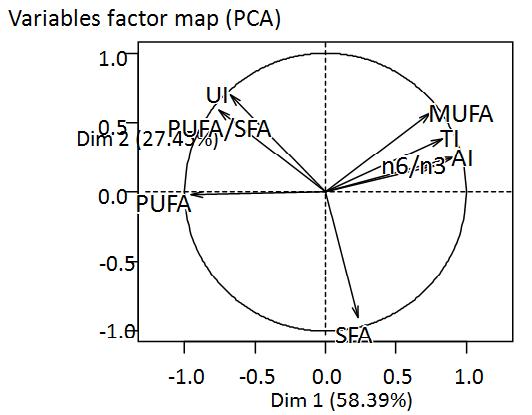 Variables MUFA, TI, AI, n6/n3 are positively correlated to the axis 1 whereas PUFA, UI, PUFA/SFA are negatively correlated. The variable SFA is negatively correlated to the axis 2. On the card of identification of the individuals (Figure 6), a light grouping according to the kind is observed. 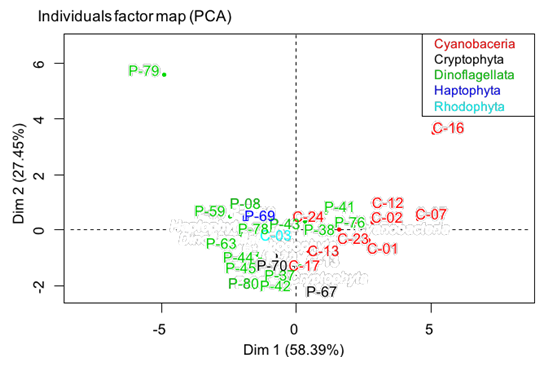 The majority of cyanobacteria are positively correlated according to the axis 1 on contrary to dinoflagellates. 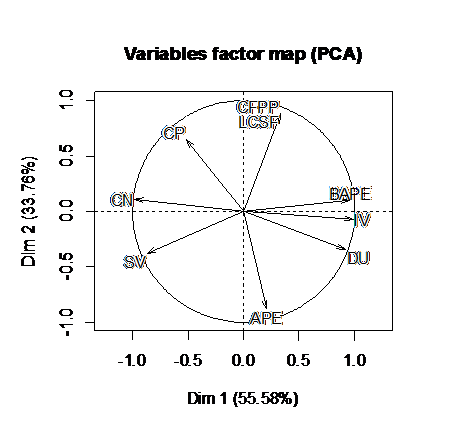 Figure 6: Individual factor map obtained in all individuals (n = 27) by principal component analysis. Individuals are projected and each color corresponds to a specific taxonomic group. 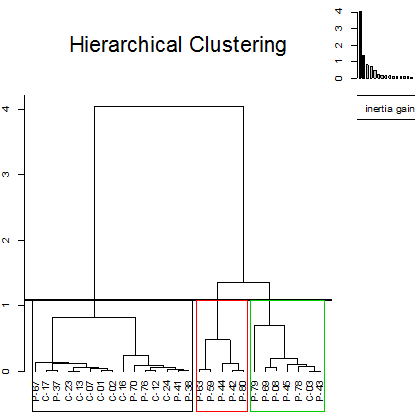 The definition of the various classes from the dendrogram and the optimal level of cut calculated by the function HCPC of package FactoMineR suggest a partition of the individuals (strains of micro-seaweeds) in 3 classes (Figure 7). The class 1 includes microalgae characterized by a lipid profile that is rich in MUFAs. Lipids of this group of micro-seaweeds have AI, TI and a n6/n3 ratio higher than the calculated average for the different strains. The class 2 consists only of Symbiodinium sp. Y6-1 (P-79). This strain is characterized by the lipid profile the most concentrated in PUFAs. For this strain, the PUFAs /SFAs ratio and index UI are the highest of all the microalgae. The class 3 gathers the strains with a lipid profile that is rich in PUFAs. The index UI is higher than the calculated average for the different strains. 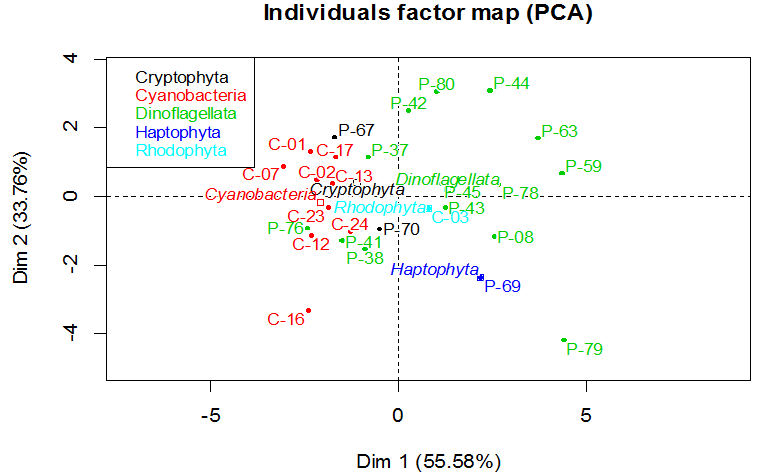 Figure 7: Cluster analysis of 27 microalgae species based on nutritional properties of microalgae. Unweight pair-group average with Euclidean distance. It should be noted that cyanobacteria are mainly present in the class 1 with the exception Spirulina sp. (C-17). The strains belonging to the groups of cryptophyta, haptophyta and most of the dinoflagellates are in the class 3. More specifically, a relation between the nutraceutical profiles of the fatty acids and the taxonomic group is observed. But no relation is observed with the geographical origin of micro-seaweeds. * The high values found for the concentration in PUFAs are the same order of magnitude as for the edible seaweeds. * The index of unsaturation of this group varies from 1.47 to 8.84. The soya oil and the cod-liver oil one have respectively values of 4.5 and 5.6. In this group, Spirulina sp. (C-17) is present. This strain could be a new candidate for the nutraceuticals market. Currently, three other strains of cyanobacteria are commercialized as nutraceuticals for their high nutritional value: Arthrospira platensis, Arthrospira maxima and Aphanizomenon flos-aquae. In the present study, 27 tropical microalgae and cyanobacteria strains were characterized in terms of their total lipid content, lipid class distribution and fatty acid composition. Further, they were investigated for their potential of biodiesel production, by estimating key fuel quality parameters. The dinoflagellates Prorocentrum lima and Amphidinium massartii, and the cyanobacteria Leptolyngbya sp. from tropical waters examined in this study have good characteristics for biodiesel production. These ones combined with a capability for culture manipulations to optimize growth and a capacity to produce oil, enhances the prospects for future use of these strains. This study is a first step to use tropical microalgae in order to product biodiesel in tropical zone with endemic strains. It is necessary to study the induction of lipids biosynthesis with physical and chemical stimulus in order to know the optimal parameters to obtain the optimum productivity of biodiesel for a commercial use. Prorocentrum lima produces DSP toxins, consequently its necessary to study its ecotoxicity before using it. Finally, the lipid profiles for these tropical marine microorganisms, from South West Indian Ocean belonging mainly to Dinophyceae and Cyanophyceae, are reported for the first time in the present study. BIOPAINTROP is a research program financed by the French Research Agency ANR (grant ANR-12- CDII-0008) and the local concil Région Réunion. It is supported by Pôle Mer PACA, Pôle Mer Bretagne and Qualitropic. Sampling in other islands such as Mayotte, Madagascar and Europa was carried out through programs supported by the Ministries of Environment and Agriculture as well as the Indian Ocean Commission (COI). We want to thank particularly Dr. Nicolas Chomérat (Ifremer, France) and Dr. Mitsunori Iwataki (University of Tokyo, Japan), for their help in Amphidinium and Prorocentrum species identification. 1. Ahmad, A.L., Mat, Yasin, N.H., Derek, C.J.C., et al. Microalgae as a sustainable energy source for biodiesel production: a review. (2011) Renewable and sustainable energy reviews 15(1): 584-593. 2. Behrenfeld, M.J., Randerson, J.T., McClain, C.R., et al. Biospheric primary production during an enso transition. (2001) Science 291(5513): 2594– 2597. 3. Costas, E., Carrillo, E., Ferrero, L.M., et al. Mutation of algae from sensitivity to resistance against environmental selective agents: the ecological genetics of Chlorophyceae under lethal doses of 3-(3,4-dichlorophenyl)-1,1-dimethylurea herbicide. (2001) Phycologia 40(5): 391–398. 4. Garcia-Villada, L., Rico, M., Altamirano, M.M., et al. Occurrence of copper resistant mutants in the toxic cyanobacteria Microcystis aeruginosa: characterization and future implications in the use of copper sulphate as algaecide. (2004) Water Res 38(8): 2207–2213. 5. Lopez-Rodas, V., Agrelo, M., Carrillo, E., et al. Resistance of microalgae to modern water contaminants as the result of rare spontaneous mutations. (2001) Euro J Phycol 36(2): 179–190. 6. Azad, A.K., Rasul, M.G., Khan, M.M.K., et al. Review of biodiesel production from microalgae: a novel source of green energy. (2014) In Int Green Energy Conf 1-9. 7. Taher, H., Al-Zuhair, S., Al-Marzouqi, A.H., et al. Effective extraction of microalgae lipids from wet biomass for biodiesel production. (2014) Biomass and bioenergy 66: 159-167. 8. Singh, B., Guldhe, A., Rawat, I., et al. Towards a sustainable approach for development of biodiesel from plant and microalgae. (2014) Renewable and sustainable Energy reviews 29: 216-245. 9. Fu, J., Yang, C., Wu, J., et al. Direct production of aviation fuels from microalgae lipids in water. (2015) Fuel 139: 678-683. 10. Doughman, D., Krupanidhi, S., Sanjeeve, C.B. Omega-3-fatty acids for nutrition and medicine considering microalgae oil as a vegetarian source of EPA and DHA. (2007) Current Diabetes Reviews 3(3): 198-203. 11. Hu, Q., Sommerfeld, M., Jarvis, E., et al. Microalgal triacylglycerols as feedstocks for biofuel production: perspectives and advances. (2008) Plant Journal 54(4): 621– 639. 12. Mata, T.M., Martins. A.A., Caetano, N.S. Microalgae for biodiesel production and other applications: a review. (2010) Renewable Sustainable Energy review 14(1): 217-232. 13. Bajhaiya, A.K., Mandotra, S.K., Suseela, M.R., et al. Algal Biodiesel: the next generation biofuel for India. (2010) Asian J Exp Bio S 1(4): 728-739. 14. Harris, WS. Fish oils and plasma lipid and lipoprotein metabolism in Humans: a critical review. (1989) Journal Lipid Research 30(6): 785-807. 15. Kumari, P., Bijo, A.J., Mantri, V.A., et al. Fatty acid profiling of tropical marine macroalgae: An analysis from chemotaxonomic and nutritional perspectives. (2013) Phytochemistry 86: 44-56. 16. Bellou, S., Baeshen, M.N., Elazzazy, A.M., et al. Microalgal lipids biochemistry and biotechnological perspectives. (2014) Biotech Adv 32(8): 1476-1493. 17. Wafar, M., Venkataraman, K., Ingole, B., et al. State of Knowledge of Coastal and Marine Biodiversity of Indian Ocean Countries. (2011) PLoS ONE 6(1): 14613. 18. Armbrust, E.V., Palumbi, S.R. Uncovering hidden worlds of ocean biodiversity. (2015) Science 348(6237): 865- 867. 19. Bouvy, M., Got, P., Domaizon, I., et al. Plankton communities in the five Iles Eparses (Western Indian Ocean) considered to be pristine ecosystems. (2016) Acta Oecologica 72: 9-20. 20. Bauer, K., Díez, B., Lugomela, C., et al. Variability in benthic diazotrophy and cyanobacterial diversity in a tropical intertidal lagoon. (2008) FEMS Microbiology ecology 63(2): 205-221. 21. Charpy, L., Langlade, M.J., Golubic, S. Cyanobactéries Benthiques. In: Arfi, R. (Ed. ), Impact des changements climatiques et anthropiques sur les flux tropiques du grand récif de Toliara. ICAR-GRT, Madagascar. (2007) pp. 34-36. 22. Charpy, L., Palinska, K., Casareto, B., et al. Dinitrogen- fixing cyanobacteria in microbial mats of two shallow coral reef ecosystems. (2010) Microbiology Ecology 59(1): 174-186. 23. Charpy, L., Casareto, B.E., Langlade, M.J., et al. Cyanobacteria in coral reef ecosystems: a review. (2012) J Marine Bio 2012(2012): 1-9. 24. Charpy, L., Palinska, K.A., Abed, R.M.M., et al. Factors influencing microbial mat composition, distribution and dinitrogen fixation in three western Indian Ocean coral reefs. (2012) Euro J Phycol 47(1): 51-66. 25. Echenique-Subiabre, I., Villeneuve, A., Golubic, S., et al. Influence of local and global environmental parameters on the composition of cyanobacterial mats in a tropical lagoon. (2015) Microbio Ecol 69(2): 234-244. 26. Zubia, M., Turquet, J., Golubic, S. Benthic cyanobacterial diversity of Iles Eparses (Scattered Islands) in the Mozambique Channel. (2016) Acta Oecologica 72: 21-32. 27. Andersen RA. Algal culturing techniques. (2005) Elsevier ISBN 0-12-088426-7, 589pp. 28. Rippka R. Isolation and purification of cyanobacteria. (1988) Methods Enzymology 167: 3-27. 29. Folch, J., Lees, M., Sloane-Stanley, G.H. A simple method for the isolation and purification of total lipids from animal tissues. (1957) J Bio Chem 226(1): 497-509. 30. Parrish CC. Separation of Aquatic Lipid Classes by Chromarod Thin-Layer Chromatography with Measurement by latroscan Flame Ionization Detection. (1987) Canadian Journal of Fisheries and Aquatic Sciences 44(4): 722–731. 31. Parrish CC. Separation of Aquatic Lipid Classes by Chromarod Thin-Layer Chromatography with Measurement by latroscan Flame Ionization Detection. (1987) Canadian Journal of Fisheries and Aquatic Sciences 44(4): 722–731. 32. Husson, F., Josse, J., Le, S., et al. FactoMineR: Multivariate Exploratory Data Analysis and Data Mining. (2015). 33. Pullen, J., Saeed., K. An overview of biodiesel oxidation stability. (2012) Renewable and Sustainable Energy Reviews 16(8): 5924–5950. 34. Krisnangkura, K.A. A simple method for estimation of cetane index of vegetable oil methyl esters. (1986) Journal of the American Oil Chemists' Society 63(4): 552-553. 35. Sarin, A., Arora, R., Singh, N.P., et al. Effect of blends of Palm-Jatropha- Pongamia biodiesels on cloud point and pour point. (2009) Energy 34(11): 2016–2021. 36. Knothe, G., Structure indices in FA chemistry. How relevant is the iodine value? (2002) Journal American Oil Chemist Society 79(9): 847–854. 37. Poerschmann, J., Spijkerman, E., Langer. U. Fatty acid patterns in Chlamydomonas sp. as a marker for nutritional regimes and temperature under extremely acidic conditions. (2004) Microbiology Ecology 48(1): 78- 89. 38. De, Lorenzo, A., Petroni, M.L., De, Luca, P.P., et al. Use of quality control indices in moderately hypocaloric Mediterranean diet for the treatment of obesity. (2001) Diabetes Nutr Metab J 14(4): 181-188. 39. Amaro, H.M., Guedes, A.C., Malcata, F.X. Advances and perspectives in using microalgae to produce biodiesel. (2011) Applied Energy 88(10): 3402-3410. 40. Mansour, M.P., Frampton, D.M.F., Nichols, P.D., et al. Lipid and fatty acid yield of nine stationary-phase microalgae: Applications and unusual C24–C28 polyunsaturated fatty acids. (2005) Journal Applied Phycology 17(4): 287–300. 41. Talebi, A.F., Mohtashami, S.K., Tabatabaei. M., et al. Fatty acids profiling: A selective criterion for screening microalgae strains for biodiesel production. (2013) Algal Research 2(3): 258–267. 42. Nascimento, I.A., Marques, S.S.I., Cabanelas, I.T.D., et al. Screening Microalgae Strains for Biodiesel Production: Lipid Productivity and Estimation of Fuel Quality Based on Fatty Acids Profiles as Selective Criteria. (2013) BioEnergy Research 6(1): 1– 13. 43. Demirbas, A., Fatih, Demirbas, M. Importance of algae oil as a source of biodiesel. (2011) Energy Conversion and Management 52(1): 163–170. 44. Volkman, J.K., Jeffrey, S.W., Nichols, P.D., et al. Fatty acid and lipid composition of 10 species of microalgae used in mariculture. (1989) J Exp Marine Bio Eco 128(3): 219-240. 45. Dunstan, G.A., Volkman, J.K., Barrett, S.M., et al. Changes in the lipid composition and maximisation of the polyunsaturated fatty acid content of three microalgae grown in mass culture. (1993) J Appl Phycol 5(1): 71-83. 46. Chia, M.A., Lombardi, A.T., Melão, Mda, G., et al. Lipid composition of Chlorella vulgaris (Trebouxiophyceae) as a function of different cadmium and phosphate concentrations. (2013) Aqua Toxicol 128–129: 171–182. 47. Khozin-Goldberg, I., Cohen, Z. The effect of phosphate starvation on the lipid and fatty acid composition of the fresh water eustigmatophyte Monodus subterraneus. (2006) Phytochemistry 67(7): 696–701. 48. Díaz-Almeyda, E., Thomé, P.E., El, Hafidi, M., et al. Differential stability of photosynthetic membranes and fatty acid composition at elevated temperature in Symbiodinium. (2011) Coral Reefs 30(1): 217-225. 49. Kneeland, J., Hughen, K., Cervino J., et al. Lipid biomarkers in Symbiodinium dinoflagellates: new indicators of thermal stress. (2013) Coral Reefs 32(4): 923–934. 50. Revel, J., Massi, L., Mehiri, M., et al. Differential distribution of lipids in epidermis, gastrodermis and hosted Symbiodinium in the sea anemone Anemonia viridis. (2016) Comp Biochem Physiol A Mol Integr Physiol 191: 140– 151. 51. Singh, J., Tripathi, R., Thakur, I.S. Characterization of endolithic cyanobacterial strain, Leptolyngbya sp. ISTCY101, for prospective recycling of CO2 and biodiesel production. (2014) Bioresource Technology 166: 345–352. 52. Marr, J.C., Jackson, A.E., McLachlan, J.L. Occurrence of Prorocentrum lima, a DSP toxin -producing species from Atlantic coast of Canada. (1992) J Appl Phycol 4(1): 17-24. 53. Belarbi, E.H., Molina, E., Chisti, Y. RETRACTED: A process for high yield and scaleable recovery of high purity eicosapentaenoic acid esters from microalgae and fish oil. (2000) Process Biochemistry 35(9): 951– 969. 54. Piloto-Rodríguez, R., Sánchez-Borroto, Y., Lapuerta, M., et al. Prediction of the cetane number of biodiesel using artificial neural networks and multiple linear regression. (2013) Energy Conversion and Management 65: 255–261. 55. BSI, BS EN 14214:2008+A1:2009, Automotive fuels – fatty acid methyl esters (FAME) for diesel engines requirements and test methods. (2008) Standards Policy and Strategy Committee, British Standards Institute. 56. Mohibbe, Azam, M., Waris, A., Nahar, N.M. Prospects and potential of fatty acid methyl esters of some non-traditional seed oils for use as biodiesel in India. (2005) Biomass Bioenergy 29(4): 293–302. 57. Kaur, S., Sarkar. M., Srivastava, R.B., et al. Fatty acid profiling and molecular characterization of some freshwater microalgae from India with potential for biodiesel production. (2012) New Biotechnology 29(3): 332–344. 58. Ghafoorunissa. Impact of quality of dietary fat on serum cholesterol and corony heart disease: focus on plant sterols and other non-glyceride components. (2009) Nati Med J India 22(3): 126- 132. 59. Paul, A.A., Southgate, D.A.T., Russell, J. First Supplement to McCance and Widdowson's. The composition of Foods. (1980) HMSO London. 60. Dal, Bosco, A., Castellini, C., Bernardini, M. Nutritional quality of rabbit meat as affected by cooking procedure and dietary vitamin E. (2001) J Food Sci 66(7): 1047-1051.